Transporting ladders, lumber, and other oversized equipment to and from your job site is critical to the success of your work. Don’t risk being slowed down by a weak, hard-to-use rack; choose the product from the Kargo Master Pro II line that fits your vehicle. Each rack in the Pro II series is constructed of 2-inch diameter steel tubing for exceptional strength over the long term. Powerful joints and zinc plated fasteners leave no weak points, and a lifetime warranty shows the confidence that Kargo Master has in its materials and workmanship. Covering the entire rack is a powder coating that resists corrosion and other types of damage, even over years of outdoor use. 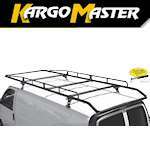 Complementing the high quality of Kargo Master’s Pro II racks are flexibility and convenience. 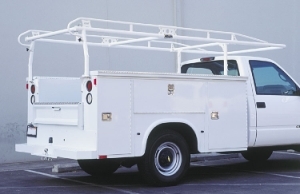 There’s a rack for virtually every truck and van size, and installation is fast and easy. To avoid drilling holes for mounting, choose the no-drill foot plate mount accessories. 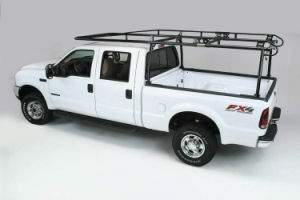 In about 30 minutes, you’ll have your durable, versatile truck mount assembled and ready for use. 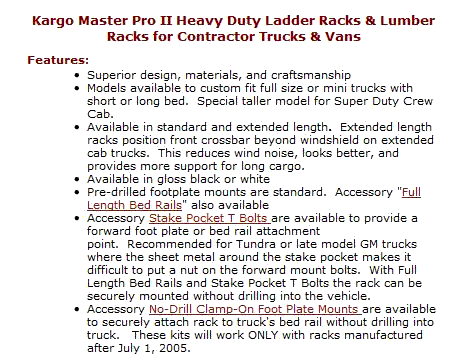 The experts at Kargo Master know what a typical day on the job holds for you, and they have created a line of racks that is fully capable of working as hard as you do. From unloading your ladders at the beginning of the day to loading them again at quitting time using the built-in rope ties, you’ll find yourself able to concentrate on the job at hand, instead of wrestling with your equipment.